Gillo’s fine college career was interrupted by military service in World War I. He spent 1920 and ’21 with the Hammond Pros and also coached the club in ‘20. The power-running fullback called “Line-Plunging” Gillo signed with the Legion for 1922. Legion went 6-4-1 to finish sixth in the NFL. Gillo followed up with 44 points in 1923 and received first-team All-NFL honors from Collyers Eye. 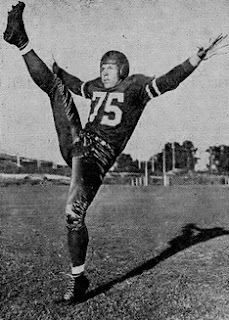 In 1924, Gillo had a successful 50-yard drop-kick for a field goal against the Milwaukee Badgers, the first of that length in pro football history, on his way to 48 points in his last year with Racine. 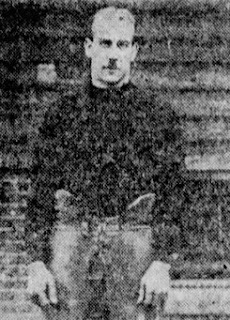 Over the course of three seasons with the Legion, Gillo produced 10 TDs, 18 PATs, and 22 field goals (21 of which were drop-kicked) for a total of 144 points. He played for the Milwaukee Badgers in 1925 and the Racine Tornadoes in 1926, which was his last season. He accounted for no more scoring after 1924. 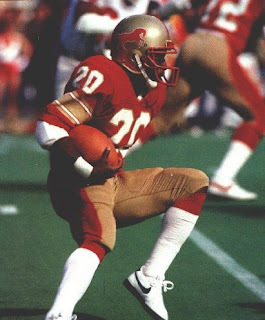 Clark caught 155 passes for 2863 yards and 16 touchdowns in college and was chosen by the Jacksonville Bulls in the first round of the 1984 USFL draft. He had 56 catches for 760 yards and two TDs as a rookie and also returned kicks. He had a lesser season in ’85 and caught only 10 passes. 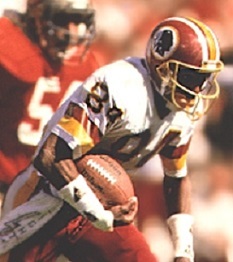 Following the demise of the USFL, he joined the Redskins in the Fall, who had taken him in the second round of the 1984 NFL Supplemental Draft. He had a big first year with Washington in ’85 with 72 receptions for 926 yards and 5 TDs. He proved to be an explosive receiver with great toughness. Redskins went 12-4 to finish second in the NFC East to qualify as a wild card playoff entry. Won NFC Wild Card playoff over Los Angeles Rams (19-7) & NFC Divisional playoff over Chicago Bears (27-13). Lost NFC Championship to New York Giants (17-0). Clark followed up with another All-Pro season in 1987, catching 56 passes for 1066 yards and 7 TDs in Washington’s Super Bowl-winning campaign, that was strike-interrupted. An off year in 1988 with a 79-catch year in ’89 for 1229 yards and 9 touchdowns. Clark garnered Pro Bowl recognition in 1990 and ’91 (75 receptions for 112 yards and 8 TDs followed by 70 catches for 1340 yards and 10 TDs). Following a 64-catch, 912-yard season in 1992, Clark moved on to the Phoenix Cardinals as a free agent in ’93. He spent two years with the Cards and finished his stellar career with Miami in 1995. 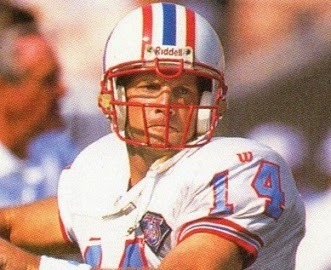 Overall in the NFL he caught 699 passes for 10,856 yards and 65 touchdowns. Of those totals, 549 receptions for 8742 yards and 58 TDs came with the Redskins. Clark received at least some first-team All-NFL honors twice and was selected to four Pro Bowls.